If you have been a tenant in Arizona and you’ve sent a request letter or tried other means of getting back withheld security deposit from your landlord and failed to get the refund, then a Security Deposit Demand Letter is your next step. Under the state laws, the landlord must refund the tenant’s security deposit within 14 days or else provide an itemized list of deductions along with the remaining balance. If you left the rental property as clean as it was when you moved in without any substantial damages, paid your rent in time and observed the terms of the lease as expected of you, yet the landlord has failed to repay the owed amount of security deposit in good faith, you can take the matter to court. Settling the matter in court is however, a lengthy process and a stressful one. 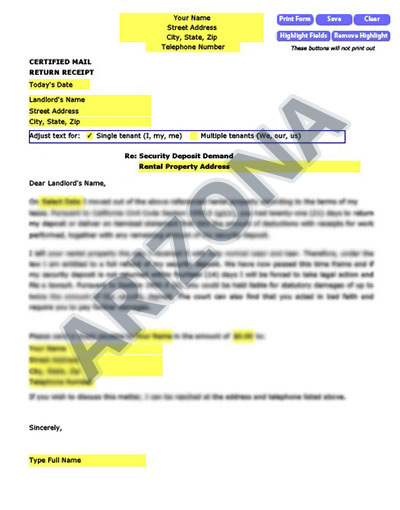 This HomeTitan’s professionally written Security Deposit Demand Letter clearly outlines the landlord-tenant laws of Arizona and is meant to act as the final warning to the landlord to send the owed amount or face the legal consequences for their intention to retain the security deposit. The landlord’s failure to comply with the provisions of Arizona state laws can lead to a penalty where they could be required to pay double the owed amount to the tenant. This is usually all it takes to get back your security deposit when all other options outside the court have failed. This letter reflects the legal weight of defaulting to pay the tenant’s security deposit in good faith and what the landlord stands to lose if the matter ends up in court. It only takes a moment to download, fill, print, and send this letter. Be sure to save your copy of this letter and send it through certified mail to be guaranteed of its delivery and get a return receipt. Unable to retrieve product order form. Our letters for Arizona renters are tailored to your state, with the right laws to get your landlord’s attention. We’ve taken care of the Security Demand details so there’s no hassle on your part to find the right law and craft an approrpriate letter. Our letters have been used in Arizona and all over America with great success.